Beautiful, yes? Frozen fruit gives off lots of juice when thawed, so to the 1/2 cup of fruit liquids, I added a couple handfuls of dried Montmorrency cherries (Trader Joe’s). You can’t see it in the photo, but the red innards are already leaking out of the unbaked crust. BAD sign. Bad, bad, bad. Out comes the pie; a bubbled-over garbled sweet-smelling mess. Too dark and way too messy. I cleaned the big drips off the yellow pyrex pie plate, but there’s no fixing too brown, short of photoshopping. And forget about the big fat messy blobs of filling all over the funky looking crust. Kim would arrive for the interview in two hours, no time to bake another pie. So, how about emergency thirded breads. 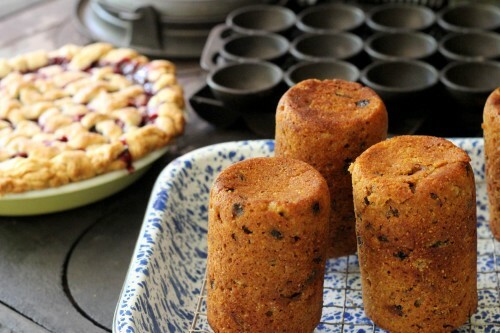 Made from local rye, cornmeal, turkey red wheat flour, and sorghum syrup, they’re just too good. A Colonial-era bread that I steam in wide-mouth pint jars (perfect for camping! ), they fortunately turned out well. Only now when I look at the pie, it looks just dandy. 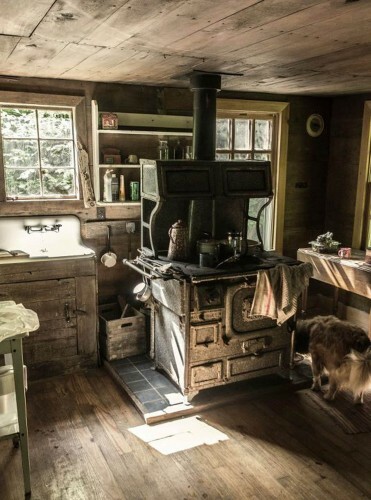 It looks like home, and it tasted like a summer evening picnic with old friends by lamplight with the peepers chirping loudly in the distance. This was a perfect pie. 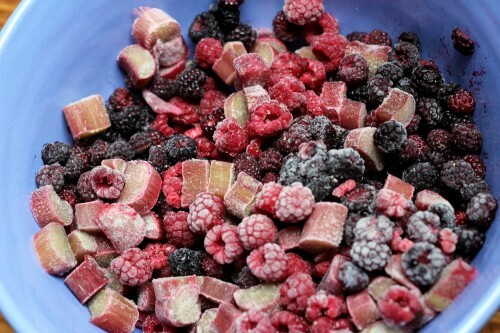 Preheat oven to 425º Thaw 6 cups frozen fruit in a colander. 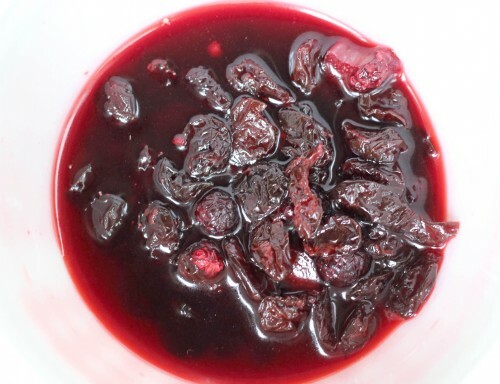 Collect the juice in a saucepan and add to it the dried sour cherries. Heat to just warm so that the cherries absorb some of the liquid. (You should have about 1/2 cup of juices.) Roll out a top and bottom pie crust. Chill the crust. Now combine sugar and tapioca flour and toss with the thawed fruit, the cherry/juice mixture, and the lemon zest. 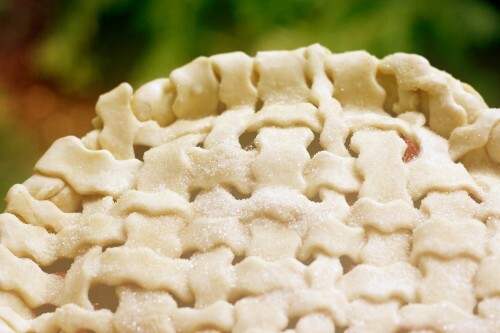 Place in unbaked bottom crust, top with lattice crust. Place in the bottom third of electric oven or bottom shelf of gas oven and bake at 425º for 15 minutes. Turn the oven down to 375º and bake until bubbled over and brown. About 30 minutes. Let it sit at least 2 hours before slicing. 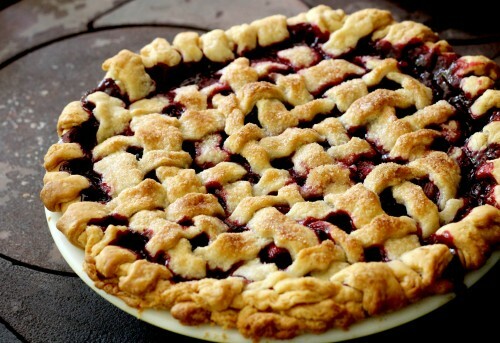 *Tapioca flour is a great thickener for berry pies. You can substitute equal amounts of corn starch, but your pie must bubble all the way to the center for 3 minutes or your starch will be cloudy, raw, and ick. You’ll need to protect the top crust from over-browning at the end of baking with foil. With tapicoa flour, the pie only needs to bubble (over) on the sides. Thanks for letting me post your photo, Wes. You are my favorite photographer!